Soft and fluffy Sugar Cookie Muffins with Peppermint Mocha Glaze are so easy! They are perfect for the holidays and even for a quick on-the-go breakfast. These are the muffins you have always been searching for and need! 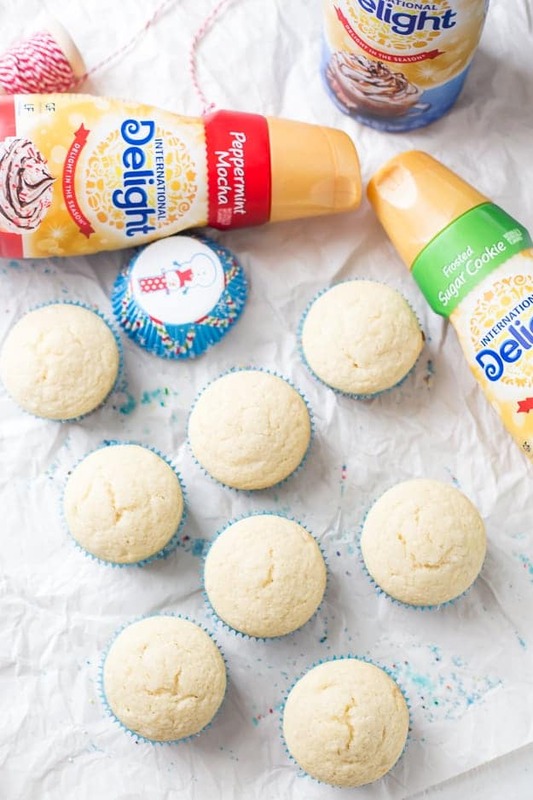 PIN IT TO YOUR MUFFIN BOARD ON PINTEREST TO SAVE IT FOR LATER! You guys!! When you see me say, “You guys! !”, In the very first sentence, you know this recipe is going to be outrageous. It’s shocking how well all of these flavors go together and create an epic muffin you will never forget. 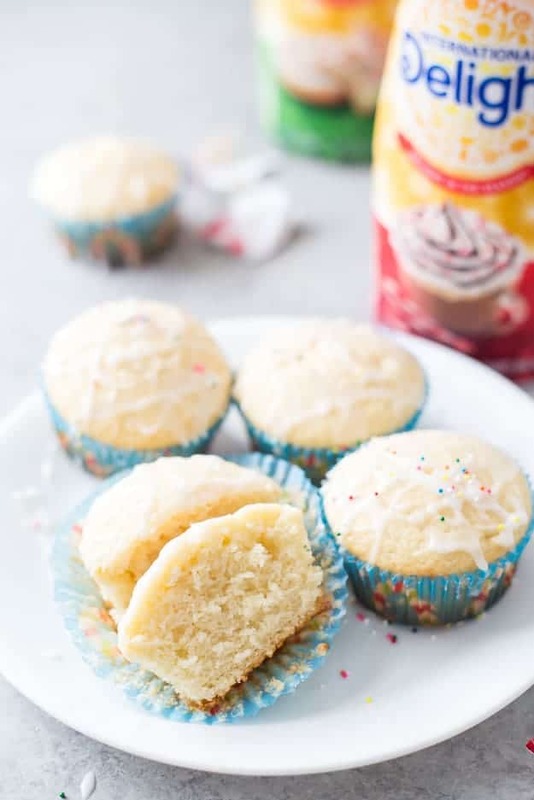 It’s perfect for the holidays and who wouldn’t love to wake up to homemade Sugar Cookie Muffins with Peppermint Mocha Glaze baking? It’s the perfect recipe to kick start your holiday baking! Does your family do a lot of baking during the holidays? It’s one of my favorites, always creates memorable moments, and allows me to listen to as much holiday music as I want. It’s a great way for families to bond and even to get the little ones in the kitchen! So what makes these muffins the ultimate muffins? For one, they are so soft, fluffy, and moist on the inside with the most delicious glaze. Every muffin recipe I have ever tested always uses buttermilk. It’s what makes the muffins, so moist and soft is the buttermilk. It helps to tenderize the gluten in the batter and creates the epic melt-in-your-mouth muffin. If you’re like me and don’t always carry buttermilk on hand, it’s so easy to make it yourself. Just remember to add one tablespoon of white vinegar to one cup of milk and let it stand for 5-10 minutes. While I am waiting for the vinegar to work its magic, I’m usually greasing the muffin tin or lining it with cute liners, like the ones pictured – they are so cute! 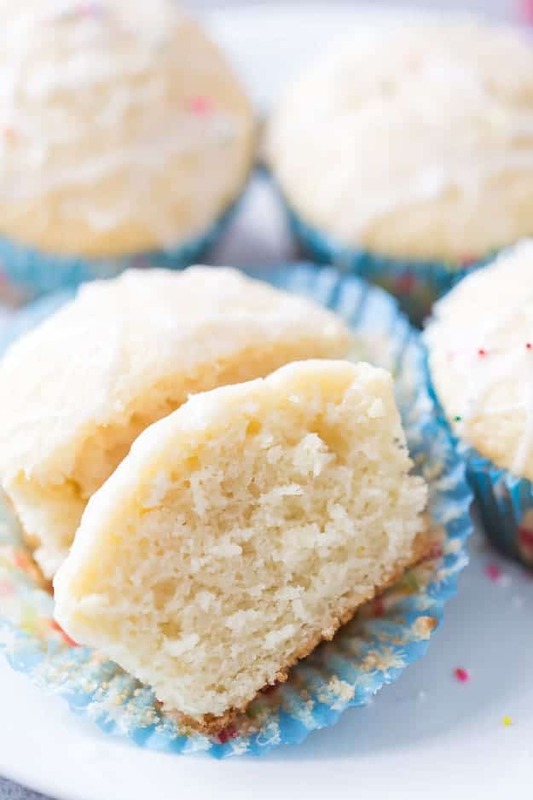 Another component in the muffins is, of course, the sugar cookie. We always have a bunch of coffee creamers on hand because I LOVE my coffee, so I decided to pick up a new holiday International Delight® Sugar Cookie Coffee Creamer. It’s perfect as an ingredient, adds so much flavor to your baking, and even in your cup of coffee! I’m having some of it in my cup as I write this, it’s so good. You guys this glaze is so easy – I promise! I made the glaze out of International Delight® Peppermint Mocha Coffee Creamer and confectioners’ sugar. The peppermint mocha glaze allows the sugar cookie muffins pop with flavor. 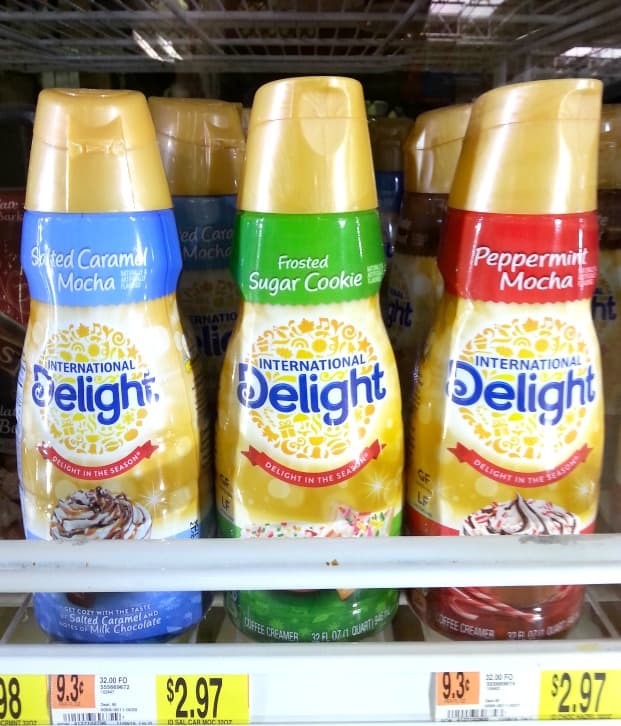 You can find many of the International Delight® Coffee Creamers at your local Walmart! During Thanksgiving weekend there will also be an in-store demo taking place – an excellent way to sample the flavors! Preheat oven to 375 degrees and line a muffin tin with liners or grease with non-stick cooking spray. Set aside. Place the buttermilk, coffee creamer, vegetable oil, egg, sugar, and vanilla extract in a large mixing bowl and whisk until combined. Whisk in the flour, baking powder, and salt until combined. 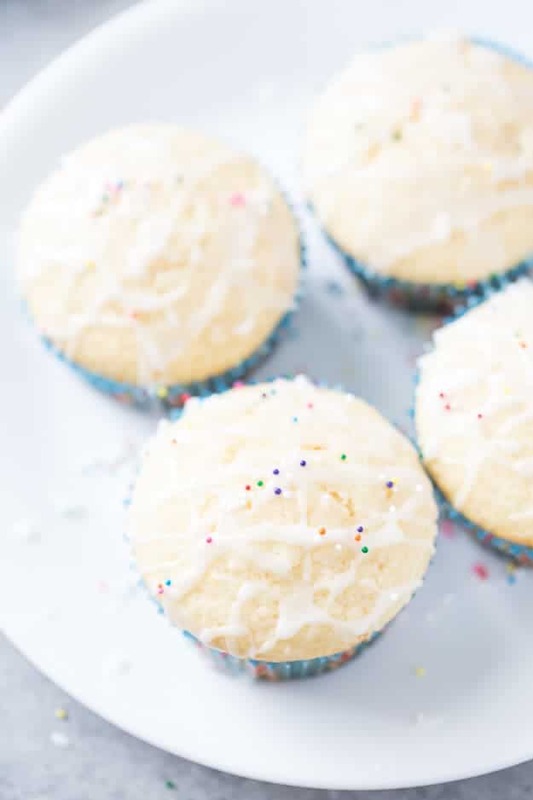 The batter shouldn't be runny, but thicker than a cupcake batter. Pour the batter into the liners or in the muffin tin and bake for 15-17 minutes or until the edges are golden brown. Remove from the oven and allow the muffins to cool for 2 minutes in the muffin tin; remove the muffins and transfer to a cooling rack until they have completely cooled. Whisk together the confectioners' sugar and the coffee creamer together until combined and creamy. Spoon the glaze over the muffins and serve.